This Online EverGraze Exchange discuses the importance of legumes and consideration in selection and establishment of legumes. The focus is on three main streams of legumes used in pastures systems with acid soils in eastern Australia. These include the annual legume Trifolium subterraneum (sub clover) and perennial legumes Medicago sativa (lucerne) and Trifolium repens (white clover). Other legumes commercially available also have roles in this landscape however their application tends to be more specialised. The attributes of these species are also provided. There are several benefits pasture legumes provide to livestock industries including: (i) the supply of free, biologically fixed, atmospheric nitrogen which increases the growth of companion grasses, (ii) higher animal intakes compared to grasses resulting from more rapid breakdown of legume material and (iii) higher protein:energy ratios in material reaching the abomasum. Consequently where pasture legumes are maintained at between 25 and 45% of the pasture dry matter, higher livestock returns can be anticipated compared with pastures with low or no legume content. Pasture legumes form a symbiotic relationship with rhizobia bacteria which form nodules on root hairs. The rhizobia obtain nutrients from the plant and the plant obtains atmospheric nitrogen from the nodules. This fixed atmospheric nitrogen becomes available to pasture grasses primarily when the pasture legume dies or is consumed and excreted by livestock. Nitrogen fixation of legumes can be calculated by legume dry matter. It is typical of subterranean clover to fix approximately 28 kg of nitrogen for every tonne of above ground legume dry matter. At a urea (46% N) cost of $550 per tonne of product or $1,195 per tonne of N, that is a benefit of $33 for every tonne of legume dry matter. In the Hamilton EverGraze experiment the sub clover content of the perennial ryegrass pastures averaged 25% throughout the year. This equates to 3.1 t/ha of dry matter or 87 kg/ha of nitrogen – equivalent to $104/ha/year. Two important factors affect the proportion of nitrogen fixed by legumes; (i) how effective the nodulation is and (ii) the level of plant-available soil nitrogen. To ensure effectiveness, it is important to (a) inoculate legume seed with the correct (and fresh) rhizobia (Table 1) and (b) ensure fixed nitrogen is utilised via companion grasses or crops. The legume content of pastures should be maintained between 25 and 45% of total dry matter to ensure adequate nitrogen supply to the companion grasses and a high plane of nutrition for livestock. To achieve this, low and frequent grazing is preferred for annual legumes where the pasture is grazed to 1,500 kg DM/ha (about a height of 5 cm) then allowed to regrow to 3,000 kg DM/ha (about a height of 15 cm) before re-grazing. The critical grazing times for subterranean clover are just prior to seedling emergence and just prior to and at flowering. Autumn grazing just prior to annual legume seedling emergence ensures competition from companion grasses (phalaris, cocksfoot, tall fescue or perennial ryegrass) is reduced. 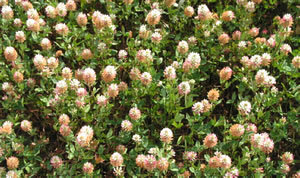 In spring, prior to flowering, subterranean clover can be grazed to encourage both flowering and seed set, while aerial seeded annual legumes (e.g. balansa clover, arrowleaf clover, gland clover) require low stocking rates or no grazing at flowering to ensure adequate seed set. There are a number of important factors that need to be considered when selecting the right legume species and cultivar for sowing. These are considered below. NSW DPI also provides a guide to selecting sub clovers. There are three types or subspecies of sub clover and these are suited to different soil pH conditions and have different capacities to withstand waterlogging. The subspecies brachycalycinum is suited to neutral and alkaline soils, as well as cracking soils, the yanninicum types are especially adapted to winter waterlogged, acidic soils and subspecies subterraneum is suited to better drained soils with acid to neutral pH. In aerial seeded legumes there are significant differences as well. Yellow serradella is tolerant of low pH and high aluminium soils while species such as balansa clover are tolerant of winter waterlogging. To have adequate seed set it is important to choose a flowering time (or maturity) that ensures seed set can occur under adequate soil moisture conditions while simultaneously trying to maximise the growing season length. Early maturing cultivars are suited to areas receiving low rainfall from April to November (e.g. 200 mm April to Nov.) and in most circumstances do not respond to late season rainfall, while late maturing varieties are suited to high rainfall areas (e.g. > 400 mm April to Nov.) and will respond to late season rainfall. Hard seed is required to ensure seed remains viable in the soil. This provides protection against seed set failure in circumstance of drought. Hard seed also helps to reduce seed losses that can occur from false breaks in summer and early autumn. Usually in low rainfall environments that receive some summer rainfall a high level of hardseed is required, while in higher rainfall environments where the summers are cooler and autumn breaks are more reliable a lower level of hard seed is desirable. Phytophthora root rot, red-legged earthmite (RLEM) and bluegreen aphid are stresses that reduce seedling survival and growth of sub clover and other legumes species. Consequently winter productivity can be dramatically reduced when these stresses are present. Selecting legume varieties that are resistant to these stresses is likely to improve legume productivity. In addition other management methods can be applied such as the Timerite® spraying date for miticide in spring which is designed to kill RLEM before they start producing eggs that can survive over summer (diaspores eggs) and hatch in the following autumn. It should be noted that chemical control using the Timerite® program will affect the population of predator insect species and may therefore increase the prevalence of other pasture pests such as blue oat mite which have a different life cycle to RLEM. Chemical control should therefore be carefully considered. Further information on pests of sub cover can be found here. 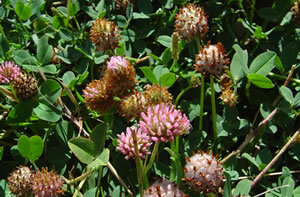 Several clover species contain oestrogenic compounds which can affect the fertility of grazing animals. Some older cultivars of sub clover were particularly high in oestrogens (e.g. Yarloop, Dwalganup and Dinninup). These cultivars are no longer sold but may still occur in some pastures. Other important health disorders that can occur include bloat in cattle and photosensitisation and red gut in sheep, although these disorders are unlikely to occur where the grass component of the pasture is higher than 50 percent by dry weight. The cultivars of many annual legumes species are listed in Table 2 and are primarily chosen on the basis of farming system and maturity (growing season length). Once these criteria have been applied choices can be made based on other criteria such as RLEM tolerance, phytophthora resistance, level of hard seed, acid soil tolerance and waterlogging tolerance. Table 2 Annual legume cultivars. Farming system: Phase = pasture is sown after each cropping phase and lasts for 3 to 6 years, Ley = pasture self regenerates after cropping for one to two years, Forage = one year of high production in year of sowing, PP = Permanent pasture. Waterlogging tolerance: S = susceptible (will die under prolonged waterlogging), MT = mildly tolerant, T = Tolerant, VT = Very tolerant (will survive and produced under prolonged waterlogging). Seed set: BG = Below Ground, IC = In Canopy, AC = Above Canopy. This information can be important for grazing management at flowering and seed set. Perennial legumes are often sown to provide an improved year round supply of green forage to livestock. However, not all environments are suitable for perennial legumes. Outlined below is a list of perennial legume options and their attributes. EverGraze included lucerne in farming systems at Wagga Wagga, Hamilton and Albany. In each of these systems, lucerne was a persistent option for responding to out of season rainfall, reducing supplementary feeding costs, providing opportunities to take lambs to higher weights, flushing ewes on green feed and reducing groundwater recharge. Lucerne is the most drought tolerant perennial legume and cultivars of this species are chosen based on winter activity (a relative measure of winter growth) and high levels of disease resistance which are often correlated with improved persistence (Table 3). The three largest restrictions on the placement of lucerne in the agricultural landscapes include poor tolerance of acid, waterlogged and/or shallow soils. The root development of lucerne is particularly sensitive to soils with high levels of free aluminium which often occur in low pH soils (< 4.7 CaCl2). In these circumstances lucerne becomes very vulnerable to other stresses such as summer drought or long grazing durations and consequently plants often die from multiple stresses. Waterlogging, if long enough has a more direct effect on lucerne survival, while transient waterlogging often improves the conditions for various root and crown rot disease infections. Both circumstance impact negatively on plant survival. Shallow soils can also impact on lucerne survival by restricting access to soil water and reducing potential root carbohydrate stores. In these circumstances addition stresses of summer drought and long grazing durations can result in significant stand thinning. If these three circumstances are avoided (acid, waterlogged and shallow soils) lucerne is a very effective long lived perennial that is capable of supplying green forage over summer and early autumn during periods when annual legumes do not. Varieties have been listed where all responses (data) were available to the stresses listed and where no susceptibility occurred. Pest and disease reaction is as follows: HR = highly resistant; R = resistant; MR = moderately resistant; LR = low resistance; S = susceptible. Winter growth rating: 3 to 4 = dormant, 5 = semi-dormant, 6 to 7 = winter active and 8 to 10 = highly winter active. White clover is the main perennial legume for high rainfall temperate pastures with broad adaptation to a diversity of soil conditions and grazing applications. However, the sensitivity of white clover to moisture-stress limits the use of current cultivars to high rainfall (> 750 mm AAR). In central NSW white clover does not take over from subterranean clover as the main pasture legume component until average annual rainfall is greater than 850mm. It is capable of tolerating waterlogging and moderately acid soils although it does respond to applications of lime. 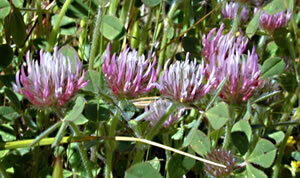 In general terms white clover is classified into large medium and small leaved cultivars. Larger leaved varieties tend to be higher yielding than smaller leaved types. Note that these categories are broad and the characteristics of leaf size and stolon density are continuous (i.e. a variety listed as ‘medium’ leaf size may be between a medium and a large leaf size. The small leaved cultivars with higher stolon density and prostrate habit are more tolerant of sheep grazing while larger leaved types that are more erect are best suited to cattle grazing. Examples of these classifications are present in Table 4. 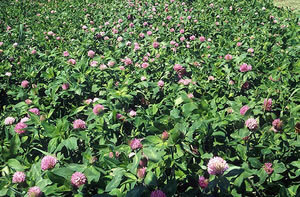 There are a range of alternative perennial legumes that have been developed as specialty plants such as red clover for short term pasture or strawberry clover for saline and waterlogging conditions. Others have been developed to be more tolerant of drought than white clover and more tolerant of acid and waterlogged soils than lucerne and include species such as Lotus corniculatus (birdsfoot trefoil), Trifolium ambiguum (Caucasian clover) and Trifolium tumens (Talish clover). New varieties of the latter three species are currently under commercial development.